Rome is famous for its mild Mediterranean winters with temperatures averaging 50-60 degrees. However, for the first time in 27 years, Rome has been blanketed by several inches of snow…not once, but twice! An unusually cold front from the north brought record freezing temperatures across Europe, and Rome got its share as well. Visitors who arrived in Rome during this time can say that they’ve seen the Roman Forum blanketed in snow. Due to safety measures, the Roman Forum, Palatine Hill, and the Coliseum were closed to the public. This allowed for a picturesque view of unspoiled snow as was sprinkled like powdered sugar over the ancient monuments. 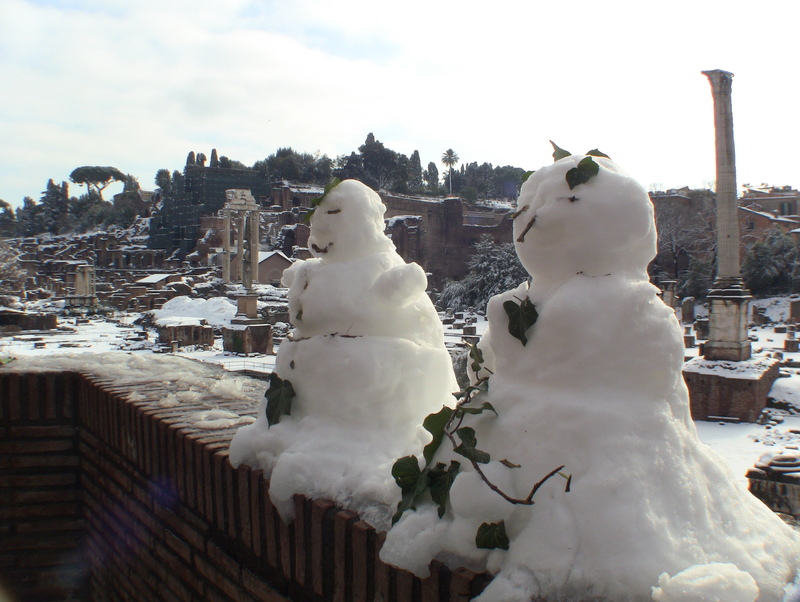 Visitors also got to see (and create) some of Rome’s new temporary residents: the Snowmen! For many, a visit to Rome covered in snow is a once in a lifetime opportunity. Weather like this appears to go into a cycle of 20+ years or so. So if anyone asks: “Does it snow in Rome?”, you can smile and answer: “2-3 times a lifetime”. Do YOU have some favorite Snow photos, videos and stories from Italy to share? Please share them in the comment box below, we’d love to see them. We hope you are having an equally enchanting winter wherever in the world you are! Thank you for stopping by our photoblog. Please stop by again as we share more photographs and stories from Rome and throughout Italy! Sharing is fun! If you found this article useful or interesting, please share it with others who might enjoy it as well! Thanks you!